Grounded in the literary history of early modern England, this study explores the intersection of cultural attitudes and material practices that shape the acquisition, circulation, and consumption of resources at the turn of the seventeenth century. Considering a formally diverse and ideologically rich array of texts from the period - including drama, poetry, and prose, as well as travel narrative and early modern political and literary theory - this book shows how ideas about what is considered 'enough' adapt to changing material conditions and how cultural forces shape those adaptations. 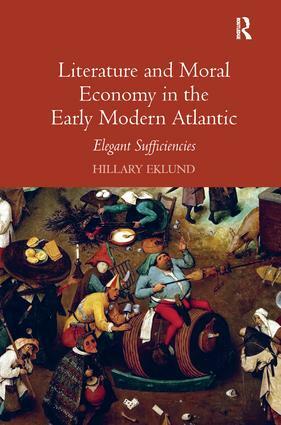 Literature and Moral Economy in the Early Modern Atlantic traces how early modern English authors improvised new models of sufficiency that pushed back the threshold of excess to the frontier of the known world itself. The book argues that standards of economic sufficiency as expressed through literature moved from subsistence toward the increasing pursuit of plenty through plunder, trade, and plantation. Author Hillary Eklund describes what it means to have enough in the moral economies of eating, travel, trade, land use and public policy. Hillary Eklund is Assistant Professor of English at Loyola University New Orleans, where she teaches courses on Shakespeare, Renaissance Literature, and the early modern Atlantic.